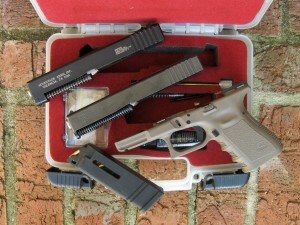 Glock 22 in Comp-Tac holster, G-19s to the right. What, in your opinion, is the single most important feature of a self-defense pistol? In our humble opinion, the most important feature is that it go BANG!, without fail, each and every time the trigger is pressed. In other words, reliability is paramount. 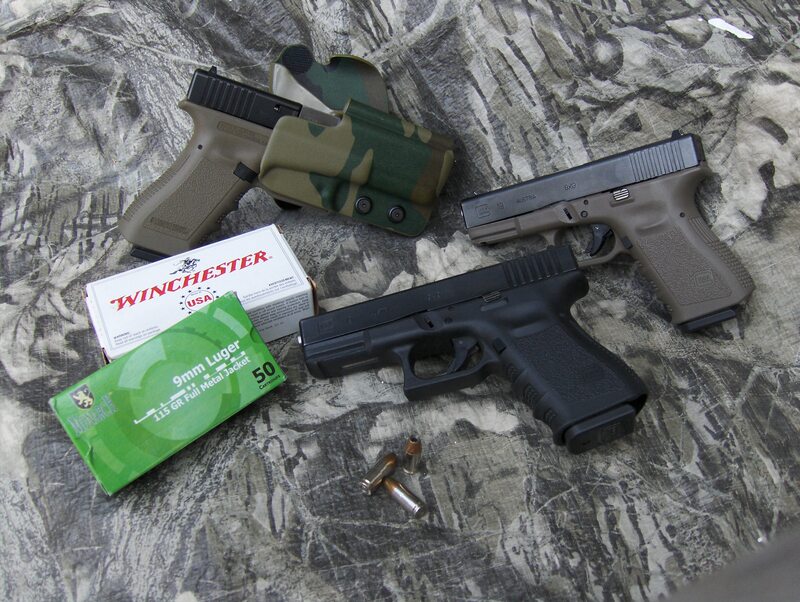 Glock pistols are legendary for their reliability. To prove this, there have been numerous and extensive “torture tests” preformed over the years. If you’re interested, simply Google “Glock torture test” and see for yourself. Glocks pass with flying colors. I have personally fired thousands of rounds through a Glock 19 and I have witnessed many more thousands of rounds fired through Glocks during training events. I have never had a failure, but I have seen one Glock fail due to a broken spring guide rod. So, Glocks are not infallible, but they are very, very reliable. Gaston Glock, an Austrian engineer, in an effort to provide a handgun to the Austrian Army, started design of the Glock 17 in 1980. In 1982, the 17 was officially adopted by the Austrian military and Gaston’s pistol rapidly spread across the globe, arriving in the US amid much hysteria among the misinformed, around 1985. Do you remember the “metal detectors can’t pick up a Glock” myth? I especially appreciate the simplicity of the pistol, not only in its basic components, but more importantly its straight forward simplicity of operation. After training with Gabe Suarez for a week in 2007, we saw the wisdom having a pistol without extra external safeties. Guys who had to manipulate an extra safety lever during a stressful drill often missed it and found themselves desperately pulling the trigger to no avail. This was especially evident in force on force drills with air soft pistols. Please note that more than half the class was made up of professional warriors, city and state police, military and private contractors on leave from Iraq as well as Mexican law enforcement. Those who had to operate safety levers (as well as retention holsters) failed to consistently neutralize the threat during stressful drills. In sharp contrast, those with “safe action” pistols, such as the Glock or S&W M&P (and no retention holster) had no problem presenting their handgun and putting rounds on target. The first time I saw the negative side of an extra safety lever was in a news report of a jewelry store robbery. The reporter used footage from the store’s surveillance camera, which had recorded the incident in detail. In the video, the bad guy is seen entering the store very much fitting the “bad guy” profile. The owner immediately went on alert while the BG turned his back pretending to check out the showcase. BG is then seen reaching in his front waist band. The owner reacts to this and beats the BG on the draw and is pointed in on him as he turns, revealing that he is indeed armed. The owner is then seen desperately pulling the trigger to no avail. The BG has no such problem working his revolver and proceeds to pop off 5 rounds before running out the store. The owner survived the incident and recounts that he did indeed miss the safety lever. So there you have it. If even professionals occasionally miss the extra safety how much more are you and I subject to these kinesthetic glitches when faced with deadly force? Please note, if you have never been in a life threatening event, much less a bona fide gunfight, do not confuse what you can do during square range practice sessions with what you may be able to do when your fine motor skills flee in the face of possible violent death. If you’d like to experience a bit of Adrenalin dump, come join us for an introduction to force on force and find out if you and your gear are up to the challenge. Another reason to like the Glock is that magazines that fit the larger models will also fit the smaller models of the same caliber. For example, I prefer the Glock 19 and carry it with the 15 round mag that comes with it, but I carry one or two 17 round Glock 17 mags for reloads. 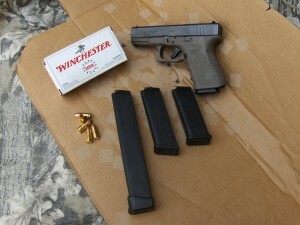 In addition, the Glock 18, 33 round mags also fit. Another advantage of the Glock is the availability of the Advantage Arms .22 rimfire conversion kit. 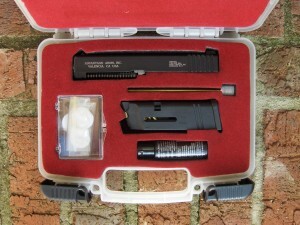 This kit allows us to use rimfire ammo for economical practice, as well as for low recoil/low noise handgun instruction. Installation of the unit is simple and takes about 15 seconds. We own the LE model and find it very accurate. 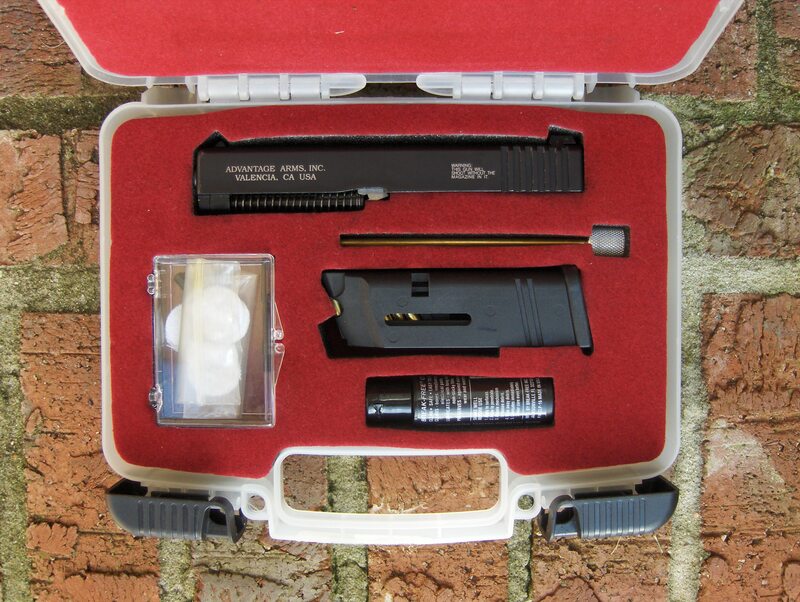 AA kit comes with one 10 rnd mag and cleaning kit. 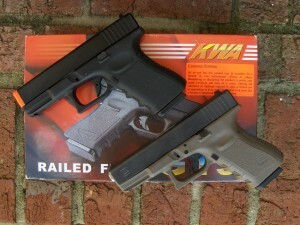 Finally, KWA makes a very nice gas powered airsoft replica of various Glock Models. We’ve had great success with two of these units and have found them to be very reliable over the last 18 months. The gun with starter kit can be found for around $120.00. Now let me temper my Glock enthusiasm by saying that some folks do not like what they call the “block-like” feeling of the Glock grip. Too, the one size fits all Glock grip really doesn’t fit all. 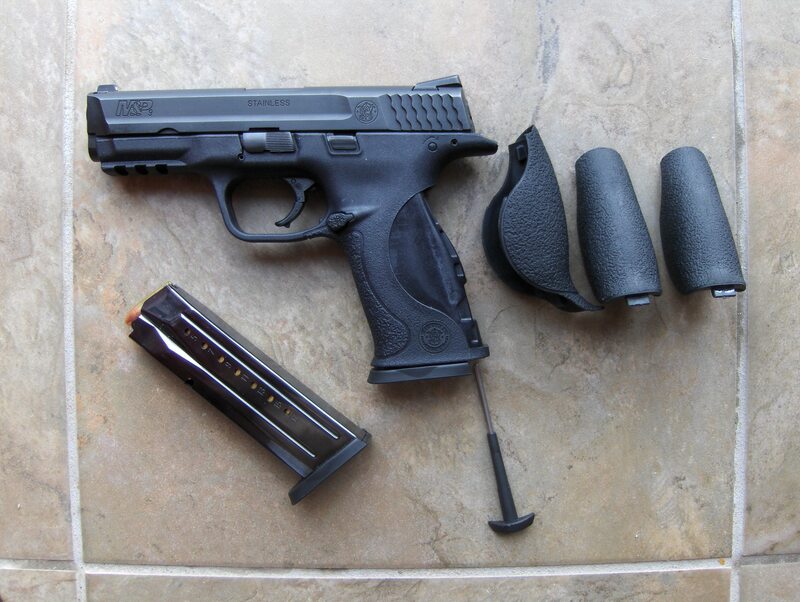 In this case, we highly recommend the Smith & Wesson M&P for its ergonomic design and interchangeable back straps. The M&P is also a “safe action” pistol. As always, if you do a class with us, you are welcome to try one or all of our various handguns before you run out and buy. You are currently browsing the archives for the Handguns category.